In the middle of the 1980's, I attended an ASCE Hydraulics Division Specialty Conference and found myself listening to a presentation by a well known government engineer who, over the years, had led the development of the dynamic wave. The dynamic wave is the most complete model of unsteady flow in open channels, including all terms in the Saint Venant equations. The latter are also referred to as the equations of continuity and motion. He described a case study using the dynamic wave. To reinforce his findings, he mentioned that he had calculated the Courant number and had found it to be within acceptable ranges for accuracy. Knowing that the Courant number can be defined using either kinematic or dynamic wave celerities, and curious to find out which one he had used, I asked him: "Which celerity did you use to define your Courant number?" He answered, pointedly: "The kinematic celerity." Therein the dichotomy: The model was dynamic, but the wave behavior was better represented with the Courant number defined in terms of the kinematic celerity. While the model was capable of describing dynamic waves, the flood wave actually being modeled was either a kinematic or diffusion wave. In fact, it has been since confirmed beyond reasonable doubt that most flood waves are actually kinematic or diffusion, and not necessarily dynamic. 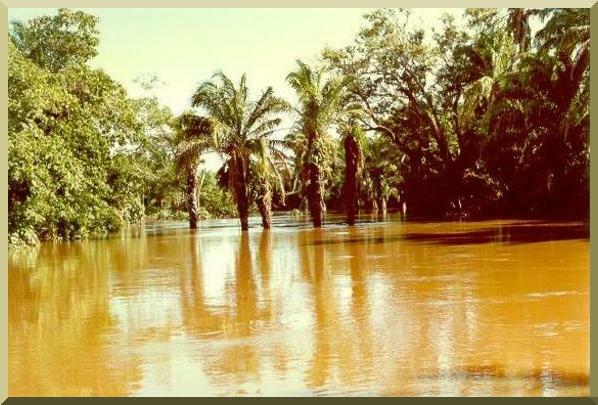 Flood stage on the Chane river, Santa Cruz department, Eastern Bolivia, on January 19, 1990.